I guess I am going to get up in a minute and see how I feel when I move around. It's noon, so if I'm going to bother to go to work at all I need to go pretty soon. I woke up at my normal time, lately - about 6:30 or a little after. (It's getting light so early that it wakes you up - at least, it wakes ME up, since our bedroom gets a good bit of light. But night week is the time change, anyway.) But today I woke up with a really, really massive headache. I don't get those bad ones all that often, even though I'm pretty sure it was sinus-related and of course my sinus problems are chronic. I say "of course" because if you've known me for a while you've probably heard plenty about them, although they've eased up in the last couple of years. Three or four years ago they were pretty much a constant problem. (I would miss at least a day or two of work a month, sometimes more, and that got to be a BIG problem.) They're better these days - I have no idea why - but we've had really changeable wether the past couple of weeks and that is usually something that causes my sinuses to make their presence known rather loudly. So anyway, when I woke up this morning with this horrible headache, I took an Aleve (generic) and an Allegra-D (prescription and not generic) and went back to bed for a while, hoping that by the time I really needed to get up, the drugs would have kicked in. And they did, some, but not enough to get me to work. Not enough to make me functional at all, which is what I needed, otherwise, what's the point of going? So I called in to work and said I didn't feel good and I *might* be in this afternoon, and took half an Ambien (more prescriptions drugs, I am a real pharmacy, aren't I?) and went back to bed. And slept right up until noon. I did get up and drag into work, although I've felt sort of weird all day. I stopped at Sonic on the way to work - comfort food - only I wasn't very hungry, as it turned out. (If that's not a sign that something's wrong with me, I don't know what is.) I did get at least a little bit of work done, so at least I won't be behind when I go to work tomorrow. The picture is a partial screen shot from the Guild Wars thing we were playing this weekend. 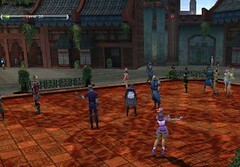 The nubile thing in purple in the foreground is "me" - my character, that is, caught in mid-dance-move. (Also, note the somewhat-less-clothed dancers on the right.) I have now given in and ordered the original Guild Wars from Amazon (because it was $10 cheaper there than in the stores here) and since I have the free-ship thing - aka Amazon Prime - it will be here on Wednesday. I decided that it worked well enough with the "bad" video card that I would just start out playing with the one I have and switch it out later. And now I have had another Ambien and am in badly in need of a bed, so good night.